File Photo: Blue Orchard Bee Cocoons. Learn more about the BOB life cycle at Crown Bees. We harvested the cocoons in June a little earlier than normal, because A) it was extraordinarily hot already and B) I was seeing chalcid wasps. After last year's losses to the parasite, I felt the need to protect the cocoons by bringing them inside the house. There the bees could continue to metamorphose safely. After a couple of months at room temperature, I put them in the dorm fridge to put them in diapause. I check the cotton ball in their little container periodically, to make sure the cocoons don't get dessicated. If you're ever looking for some land to park some beehives on, don't ask a realtor. Too much Beekeeping 101 is involved. 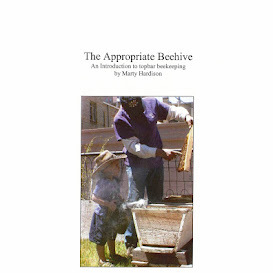 You have to ask another beekeeper because they know what bees need, and that's all you're looking for. So of course, it was John the Beekeeper who found the site. He's also still kindly tending our Warré Hive for us. In the Spring, we plan to take Remainder or a split from Prime. Maybe both. Both hives are still quite populous. That's typical for young queens, and both colonies are three boxes tall. The top box is all honey, and the bottom two are where the bees are living. With Warré hives, you don't pull out combs to inspect so we don't know exactly how much, but I have no doubt the middle box of both holds honey as well, in a band arching over the brood nest. That's what bees do. Prime is headed by the queen that pulled through last Winter, with just 5ish combs of brood and 3ish combs of honey, some of which was still in the hive when we harvested in August. These are very frugal bees indeed. Remainder is headed by a Spring 2013 daughter queen so her colony is slightly more populous. But we're confident that she carries those frugal genes and that one super, about 30 lbs., of honey will be sufficient Winter stores. The bottom box of both hives contains only partial combs, and we are leaving them in place for the Winter. My preference is to keep the brood nest high, in case deep snow comes, which it invariably does here in Colorado. Anticipating the snow, we'll provide a small top entrance. I'm in the process of converting an Imirie shim into a Winter candy board, which should provide the bees with emergency food, overhead insulation and an upper entrance all at once. When it's done, I'll show you what it looks like and how it's supposed to work. BTW if you're wondering about wrapping your hives, it's too early. In Colorado, wrapped hives will get too warm in Indian Summer, which we always get. Right now, you should be collecting material in preparation for the extended cold. I aim to be prepared by Halloween, with sheets of felt or foam and bubble wrap, and a remnant of black Sunbrella fabric I bought on EBay.